We all use our smartphones to record video, that's a given. But even with high-end smartphones having built-in stabilisation, video captured on the move can still come out shaky. Which is where the DJI Osmo Mobile 2 gimbal system comes in, promising to nullify camera shake with ease. Assuming you're not making the next Cloverfield or Blair Witch Project, that's ideal for smooth motion and professional-looking capture. In addition, the sequel to the Osmo smartphone stabiliser is more affordable, lighter-weight and longer-lasting. Can it do no wrong? The design of the new Osmo Mobile 2 follows the same approach as the original, but sees a number of improvements. With the first-generation model, DJI utilised nylon and magnesium alloy for a high quality, solid finish. This time out, the company has opted to just use the high-performance nylon - which makes it slightly lighter and much cheaper to build. It might be made from plastic, but it's still strong and sturdy. A big addition to the Osmo 2 is the inclusion of zoom controls on the handle - allowing you zoom control via your thumb, rather than being forced to use the phone's screen - plus a reconfiguration of the buttons to makes everything much easier to control. Some buttons offer double or triple functionality. For those who want to use a tripod with the Osmo Mobile 2 there's a 1/4-inch standard accessory mount at the bottom. Some more professional users may be disappointed to see there's no longer an accessory mount on the side (which was used to conveniently attach external microphones in the original model) - but we suspect this won't be an issue for most and is in the interest of keeping the price down. Another major new feature is portrait shooting mode, presumably for SnapChat fans, although you will have to lock in whether you want landscape or portrait orientation before you start shooting, as you can't switch mid-way through capture. To access these modes and other features you will need to use the company's DJI Go app (for iOS and Android). It's free to download and easy to use, letting you control your phone's camera from the unit's buttons (via a Bluetooth connection). Beyond filming the app also offers basic video editing options, mainly by auto-editing your footage to make it more exciting. While that's appealing, we get the feeling that the people who are likely to be investing in an Osmo Mobile 2 will want to edit stuff themselves. Still, you'll need to use the Editor to save your footage to your Photos album - as it doesn't do this automatically. Like the Osmo Mobile before it, the Osmo Mobile 2 features a number of capture modes to make your video shooting as smooth as possible. There's SmoothTrack mode, which will smoothly follow your arm's movements to reduce shake; ActiveLock, which will do it's best to lock onto a specific point regardless of where you then move; and Face Tracking, which locks onto a subject target's face. 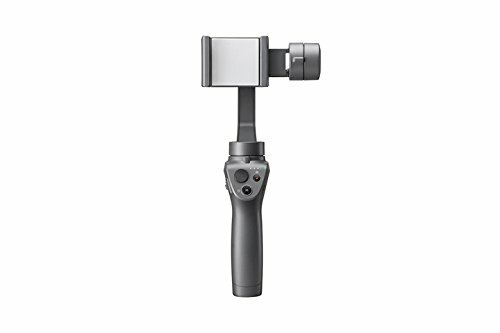 The Osmo Mobile 2 uses DJI's proprietary SmoothTrack technology - as found on its drones - plus a three-axis gimbal that compensates for any juddery movements or camera positions that you make. Try as you may, it will be virtually impossible to make video look shaky with the Osmo Mobile 2. Even jumping up and down on the spot will smooth-out the capture. However, there are limits: move too quickly - and we mean really quickly - and the gimbal can get a little confused. Of the modes there are three main modes we've found ourselves using. A single tap of the M button on the hilt of the unit and you'll turn on ActiveLock, which is great for keeping things still and focusing on a single plain of space rather than just the gimbal following your every movement. A double-tap of the M button will centre the phone in the cradle, while a triple-tap of the button switches it to selfie mode for those vlogging moments. Beyond the filming modes you can control the movement either by the very sensitive joypad on the hilt, or by moving the gimbal slowly with you hand, which proved easier at first. One of the staples of DJI's entire ecosystem is ActiveTrack, which allows you to draw around an object or person and have the camera lock on to them. This, powered by AI, is the Osmo's most impressive feature. In our tests it happily followed us around a room. It's not just people either, it can track any object - although you'll get better results if the object you are tracking is clearly defined. In addition there are stop-motion capture modes: Timelapse, which needs a fixed camera to capture intervals of a scene; Hyperlapse, which is similar to Timelapse, but can be used with the gimbal hand-held; and Motionlapse, which allows you to set the start and end positions and then length of the timelapse you want to create, to produce motion through the scene. These are really cool, especially Motionlapse. Intervals can be set from half a second to a minute, with duration from 30 seconds to three hours overall. The mounted gimbal then goes off and does what you need, producing incredibly smooth results. And because of the new enhanced battery it won't run out of juice mid-way through capture. Another notable difference between the first-gen and second-gen Osmo is the battery. While the previous one had a removable battery, the follow-up model has a non-removable internal one. While that may seem a downgrade, it's not. Not even close. It means it's more capacious than before. You'll now be able to use the camera stabiliser for a whopping 15 hours between charges. That's up from just four hours in the original model. The gimbal can also charge your phone while you use it to extend your phone's filming time. That means no more worrying about whether or not it will survive a full day's worth of shooting. It's a great feature. If you're looking to capture incredibly smooth footage from your smartphone then the DJI Osmo Mobile 2 will certainly give you the results you want. And then some. It's already become a staple for Pocket-lint videos, much to the happiness of our video editor. With impressive stabilisation for ultimate smoothness, plus new features, a better battery and a cheaper price than the original product, the Osmo Mobile 2 rarely puts a foot wrong. It's mighty impressive. The unit was kindly loaned to us by RC Geeks.